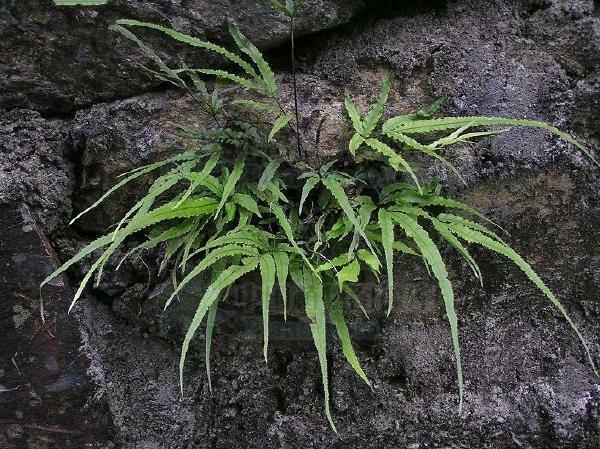 The drug is the dried whole plant of Pteris dactylina Hook. (family Pteridaceae), growing along gullies and rock sutures at shady places of mountains, and distributed in Gansu, Sichuan, Guizhou, Yunnan, Xizang of China. The aerial part contains pterosin B, F, O, Q, and 2β, 15α-dihydroxyent-kaur-16-ene, creticoside A, B, and 2β, 16α-dihydroxy-ent-kaurane. It is used to clear away toxic heat, to promote diuresis and arrest convulsion; for the treatment of dysentery, diarrhea, enteritis, parotitis, lymphadenitis, infantile convulsion, bite by mad dog, abnormal leukorrhea, edema.